Good morning sweet friends! Popping in today to share another card for Day of Giving Friday. Since I’m at CHA I thought the sentiment I’m showing today would be so, so appropriate! 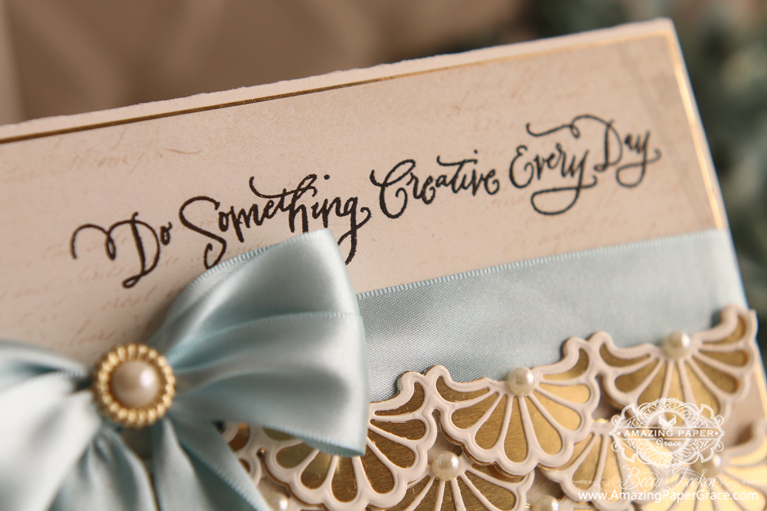 Do Something Creative Every Day. Today I’m giving away another of the cards made with Graceful Borders but it is done in the conventional way. I’ve taken Spellbinders Graceful Fans and simply stacked it up to make a half-high background (you know I love doing this). You simply adhere each layer, overlapping, using foam tape. This seems so frilly!! For the bottom, I’ve used one of the three borders from Graceful Sweet Words to add an arched scallop to the bottom. For new readers, every Friday it’s my pleasure to give away a card. The card goes to a randomly picked reader (worldwide) who leaves a comment in our conversation. Want to know more about Day of Giving, here’s a link to my FAQ’s just check out #11. You can check to see if your name is on the list of winners HERE! For your comment: I’m taking in a new city today – where did you grow up and why was it special? I’m blogging from my hotel room today but sending a squeeze and a hug to all of you sweet readers. I’m looking forward to CHA and carry you in my heart. Wow!! I adore this card!! So beautiful!!! I grew up in rome, ny. what was special about it was that it was a small town with big city activities. I grew up in the 60’s-70’s. we had supper sports for girl’s and boy’s. long before title 9. we could learn tennis, golf, archery, and swimming at no cost to us. we were encouraged to play outside. Welcome to sunny Arizona, Becca! Lol. Sorry it’s not so sunny for your visit. Normally this time of year is beautiful, but unfortunately this year we are having a rough winter. I grew up in the suburbs of Chicago, Illinois. I think my era of childhood was special, not because of where I lived, but rather because of the time period. It seemed to be more peaceful & we certainly did not have to worry about playing in the streets or speaking to adults we did not know. We were taught to speak when spoken to, so we answered. I adore the Phoenix area & would prefer to never have to move, but I love the city of Chicago for the culture, architecture, and the lake front. Beautiful! I grew up in a small town in Pa.Everyone knows everyone and all are hard working families. Hi Becca it is always so nice to receive your posts as your cards are always beautiful. The choice of dies the colour of the card and the composition are always so beautifully thought out, I think anyone would be pleased to receive line of your cards. I don’t really have one special special? place as we moved around whilst I was young, but my home now is special as it is where I was living when my children were born so it will always be special. I do hope that you are enjoying CHA. Love you creative card Becca. BEAUTIFUL CARD BECCA!!! Hope you are having fun at CHA! I was born and raised in Miami, Florida…it was warm and sunny and FUN! Now live in Salem, OR with all the season changes, but mostly mild weather…loving it! Have FUN at CHA!!! I KNOW you WILL! LOL First, what stamp did you use for the scripty writing? I didn’t see a credit for it. It’s BEAUTIFUL!!! AND your card is GORGEOUS with the dies! SIGH! YOU NEVER FAIL to please us with your creations!!!! What a fabulous card today, Becca. I’m loving these new border dies, they are so versatile. WOUW Becca this is sooo gorgeous. I´m always sooo amazed by the beauty you manage to get out in every single card you ever make, and also this one here. Another great use of those borders; I’m really loving all the different uses you present! Gorgeous card, Becca! I love the lacy look and the rich colors. So elegant. This card is gorgeous, I love what you did with it. I grew up in a suburb in Sydney Australia. I love it & continue to love it because of the community feel, family friends, the weather & nature that surrounds us. Hi Becca – this is another gorgeous card!! Love the texture the repeated dies cuts give. I grew up in a very small town in New Zealand, and it was special because of the love within my family and the great friendships I had – it was the sort of town where most people knew everyone :-) couldn’t really get into mischief as it would soon get back to my parents ears!! Just live the soft colors and gorgeous lace scalloped edges. So beautiful becca! Hi Becca , so beautiful and soft is your card, i love it . I grew up in a little village in Alsager S O T England , we could play in the road safely because it hardly had traffic to come along , it was a rare treat for us kiddies to see a motor car . row your dies are so clever . beautiful stone church and school was our home. house,my Mum had to be so carefull if she was in the garden or going somewhere as I would call out and want to go with her lol. What a lovely and appropriate card! Love the frilly look. I grew up in a small town in Ohio and what made it very special actually wasn’t the town at all, it was my grand mother who actually ived in the next town over. Visiting her and being with her was my favorite thing to do. I just loved her yard, full of flowers that she let me pick! A cherry tree that I ate all of the cherries I could off of and the rest my Grams made into sweet pies! A small cluster of apples trees in the back yard kept us supplied with Granny smiths and red apples. Being at Grams house was like my Heaven on Earth. I still dream about that place and have fond memories of it still. It was truly the love of my Grandma that made the place so special and I miss her still today! 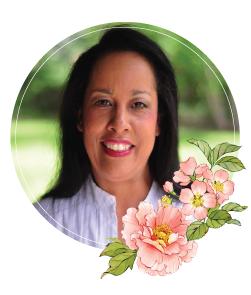 Now that I am the Grammie, I try to make my house and yard just as appealing to my grand daughters with Flower fairy gardens, strawberry and raspberries and all sorts of veggies to snack on, similar to how my Grams did for me. But most of all, I try to love them as much as I possibly can! 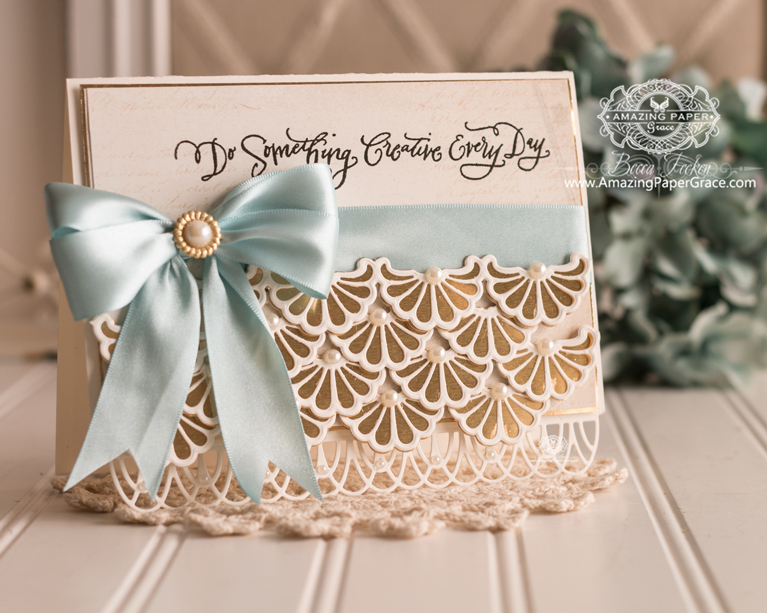 I love this card with the petticoat effect! It brought back memories of a party dress my mother made for me out of lace when I was about 6. She was a fine needlewoman and so my clothes were handmade and different! I grew up in a town in the south east of England. We lived in a small cul-de-sac of 31 houses and we lived at one side of the banjo and my aunt and uncle lived at the other side, just 4 doors away. Our houses backed onto a large field where all the children from the road would play and where every November, we would build a huge bonfire and everyone would pool their fireworks to have a display. We would wrap potatoes in tin foil and bake them in the fire and heat tomato soup, sausages and baked beans round the edges which we would then eat in our wellies, coats, hats and scarves! So exciting! Most of our neighbours didn’t have cars and so we were able to roller skate quite safely around the pavements. Life was uncomplicated, gentle and good! Thanks for the memory prompt, Becca! hope you are enjoying CHA. I grew in a place called the Phoenix Park, Dublin Ireland. The largest walled park in Europe. We lived in the married quarters of the police force in Ireland. All our dads were police, Garda called here. We all live all over the world but lots of us are still friends. I spent the day yesterday with my girlfriend, we met 50 years ago when her Dad came to work with mine. Great times and the best of friends. Thank you Becca for your beautiful new dies, I am having great fun with them. I hope I am lucky enough to win one of your cards. Beautiful card today – as always. Never cease to amaze me! I grew up in the Catskill mountains of upstate N Y in a one-horse town Shinhopple. No lights and maybe 150 population including cats and dogs. One little general store with gas pumps and the post office. 50’s and 60’s were a great time and I wouldn’the change a thing. Been married now for soon to be 54 years. Have a ball at CHA!! I just cry when I see your beautiful new cards and dies! I love your Graceful sweet words set and now I want this one too! Good morning Becca, simply stunning!!! Have a great time at CHA!!! I grew up in a place called Eckington in Derbyshire. U.K we had fun riding our bikes being outside during the summer holidays and just being kids. Happy times!!! Well, I grew up in Hutchinson, Kansas and well they are famous for the State Fair, The Annual RV Show, The Annual Home and Garden Expo. But the last time I was there they were suffering a major loss of residents due to the Brine well explosions and the Gas pockets up under the city due to the Cary Salt Mine . They closed the mine and turned it into a museum and restaurant last I heard. but hat would have been 13 years ago this February 14th when my now hubby flew me up to get me out of a very volatile family situation. What a gorgeous card. . . Gosh I hope I win this one!!! You’ve out done yourself, I’m in love with this gorgeous card and sentiment! I grew up in the SanFernando Valley, Sepulveda, CA, yes you can say I’m “a Valley girl” ha ha ha. Why was it special, oh I have such fond memories of growing up, family time, a neighborhood where all our neighbors lived there for at least 35-40 yrs, so they are more like family than the neighbor next door, many, many a night of playing kick ball/softball/fressbie in the street with teams consisting of children and parents. Lots of times where families would gather at a house just to visit! Summers spent going to the ocean, Zumba beach, or play games, card games, Spoons or whatever we fancied at the time for a whole afternoon. What a wonderful question, thank you for letting me return to my childhood and the wonderful memories. What a gorgeous and elegant card, Becca! I grew up in a small town by the sea, and could not settle down any place without being able to get a glimpse of the sea and the wide horizon everyday. Hya Becca stunning card as always !! This is a beautiful design, I truly adore it. We are all so glad you came into our lives with your designs. Hi Becca, A truly stunning card with a fantastic sentiment!! I grew up in a small town in Lancashire, England called Leigh, I had a fantastic childhood and my childhood home holds many ‘special’ memories for me, in fact I would love to live in that same house again if I could. Very pretty card as usual, but you only make beautiful ones. Lovely card and I wish I could tie a bow like that! Hello Becca – you are in my neck of the woods this weekend since I live southeast of Phoenix! I hope you enjoy your time here. I actually grew up in southern California and feel incredibly blessed to have grown up in a small town atmosphere outside the big city of Los Angeles. Our town was in the foothills above Los Angeles and was a wonderful place to grow up. A job transfer is the only reason I’m in Arizona but I do love it here too. You know, I shouldn’t be surprised when I pull up your blog and it takes my breath away, but here I am delightfully surprised with this stunner! !